This sporty edition of the "Italian Eagle" attacks the asphalt mile after mile – with Italian style, more power and a smoother-than-ever ride. 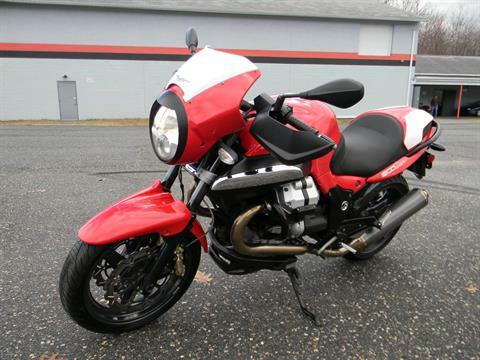 The new 2008 Moto Guzzi 1200 Breva Sport is the most aggressive sibling in the Breva family of Naked bikes, which includes the Breva 1100 and Breva 750. With added horsepower and more torque available at even lower revs, lowered gearing and a host of other performance enhancements, the Sport is also the ideal Moto Guzzi for the rider who wants to log cruising miles in comfort while having an arsenal of performance features on tap. And, while the tech specs point to the Breva Sport’s penchant for setting a pulse-quickening pace, this V-twin Naked also sends a serious message while standing still, thanks to classic racing graphics, a racing exhaust and standard equipment like a tubular, low-rise handlebar, titanium-treated forks, a café-racer style fairing, aluminum foot pegs, sports seat, sport tires and powerful wave front disc brakes. A full Racing Kit for optimum performance is an added option. When Carlo Guzzi engineered the first Moto Guzzi over 85 years ago, he wanted to shatter the notion that motorcycles should sacrifice function, reliability and comfort for pure speed. His philosophy that the perfect motorcycle offers a balance of all these riding qualities has inspired every Moto Guzzi designer and engineer since, and the 1200 Breva Sport again celebrates the company founder’s unique point of view. Rims: Front: 3.5 x 17 in.Rear: 5.5 x 17 in. The 1200 Breva Sport’s super comfortable upright riding position and balanced center of gravity is one reason that Naked bikes continue to grow in popularity in the U.S. market. 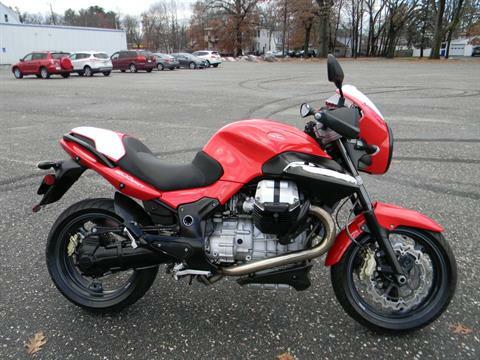 For the 2008 Breva Sport, Moto Guzzi has complemented the bike’s sporty profile further with a new tubular low-rise handlebar. 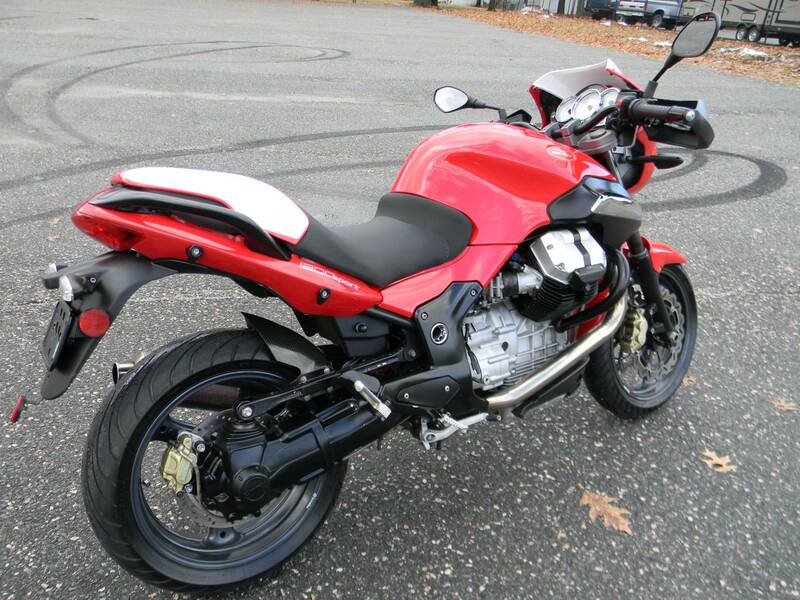 Combined with a new seat design and repositioned aluminum footpegs, Moto Guzzi has created an ergonomically superior riding position and a large-displacement machine that actually feels and handles like a much smaller sports bike. 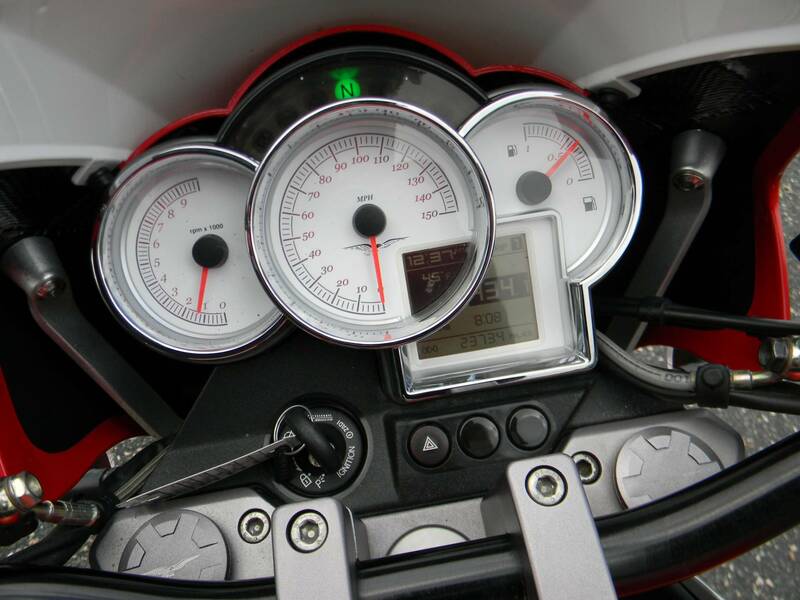 Conversely, when the 1200 Breva Sport goes on tour, new features like a small fairing above the headlight and easy-to-read instrument panel add to riding enjoyment. 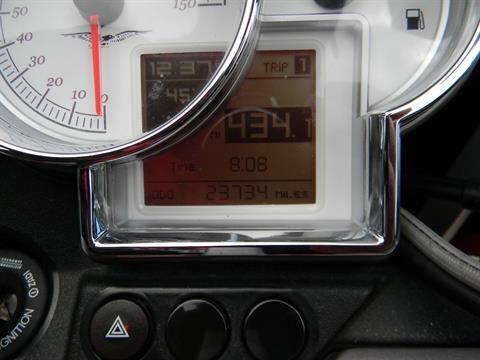 Handlebar-mounted controls give easy access to trip information displayed on the onboard interactive computer display. Custom Hard Case Luggage: As a perfect complement to the 1200 Sport’s sporting and touring personality, riders can consider an exclusive hard case luggage system that integrates perfectly with the motorcycle. With side panniers mounted, riders have 7.7-gallons of cargo capacity. Each piece is designed with a durable fabric liner to protect stored items. When riders want to cruise truly Naked, the bike retains its stylish lines because the luggage mountings have been designed not to detract from the 1200 Sport’s lines. Identified by the classic Italian Eagle logo, the panniers are crafted with great attention to detail, including a double scratch-proof surface treatment and side guarDual Sport. Single Top Box Kit: An additional top box kit is a perfect color match to the side cases. Finished in matte Black, the 7.5-gallon top box is large enough to hold a full face helmet. The kit also includes a backrest for improved passenger comfort, plus a mounting rack in composite material. Double Top Box Kit: Ideal for two-up touring, this elegant, matte Black, 12-gallon top box is roomy enough to hold two full-face helmets. The box arrives complete with a mounting rack. Top Box Bag: This bag was designed for the 1200 Sport’s side carriers. The waterproof Nylon and PVC bag is easily removed and becomes a handy shoulder bag. Luggage Rack Kit: This versatile luggage rack kit is made from steel and composite materials. It allows the 7.5-gallon and 12-gallon top boxes to be fitted in three different positions or can be used for fitting the top box bag. Tank Bag: This practical PVC and Nylon tank bag can be stuffed with up to 4.3-gallons of essentials and is an indispensable touring accessory. Designed from input gathered from Moto Guzzi touring enthusiasts, the bag has a rain-proof zipper, reflective inserts and a rain hood for added protection against even the worst weather. A handle and strap transform the bag into easy-to-haul hand luggage. External pockets provide useful storage for glasses, maps, gloves and other travel take-alongs. Comes complete with support for easy fitting and removal. Lowered Seat: A lowered seat option can be a valuable alternative for shorter riders. This accessory decreases seat height, while retaining the benefits of the original seat’s gel padding system. Center Stand: Many Moto Guzzi owners like to "do it yourself" – and the center stand option makes maintenance even easier. 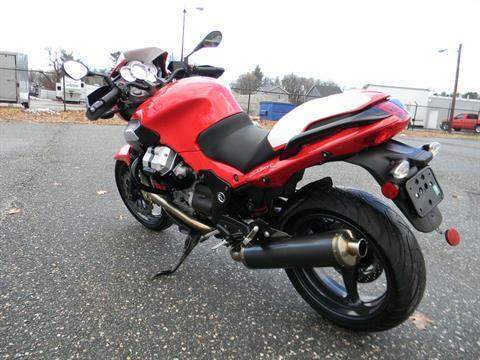 Anti-theft System: To keep your 1200 Breva Sport out of coveting hanDual Sport, add a Moto-Guzzi specific anti-theft system. The two-box system includes a control unit and two remote controls. The second houses the wiring, bracket and fittings. Custom Bike Cover: Keep your Sport looking like the day you bought with a 1200 Sport branded motorcycle cover, custom tailored to fit your motorcycle. 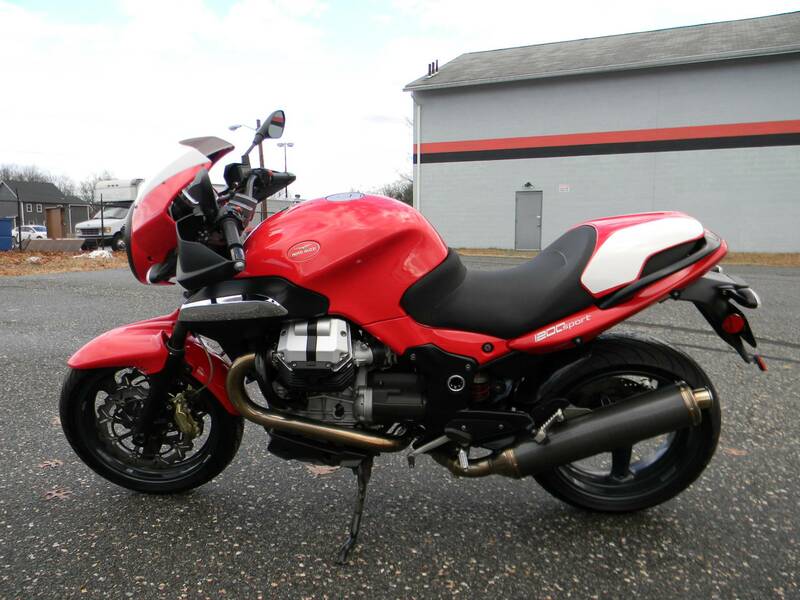 The responsive, precise handling of the Moto Guzzi 1200 Breva Sport is a result of the motorcycle’s high-performance frame and suspension set-up. The high-tensile steel chassis is extremely rigid and, together with the aluminum single swing-arm, forms a one-piece section housing the patented shaft drive. Breva Sport’s stable, confidence-inspiring feel. 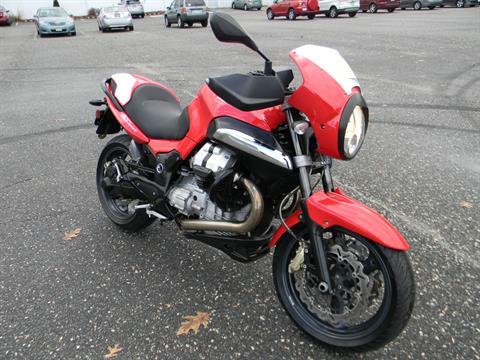 And, thanks to the Moto Guzzi’s patented shaft drive, acceleration is silky-smooth. Deceleration is handled just as elegantly by twin 320-millimeter discs and four piston (opposed) calipers at the front and a 298-millimeter rear disc with two floating parallel pistons. The large, new wave rotors on the front brakes feature decreased distortion, weight and improved cooling. Metzler sport tires provide superior traction and feel. Moto Guzzi aficionados already understand the siren lure of their favorite Italian motorcycle brand’s thoroughly unique "motor music". But while the proud thump of every Guzzi is indeed a classic, the technology on today’s Moto Guzzi is advanced. The 1200 Sport benefits from the latest generation Moto Guzzi transverse 90-degree V-twin, which continues to pay homage to Carlo Guzzi’s engineering genius. From its signature protruding rocker boxes and patented "reactive" shaft drive to its signature exhaust note, the 1200 Breva Sport is pure Guzzi. The Sport’s 1,151-cubic-centimeter, 94-horsepower V-twin powerplant delivers almost ten more horsepower than its Breva 1100 sibling, and adDual Sport even more torque on tap at lower revs – a maximum of 73.8 foot-pounDual Sport at just 5,800 rpms. Moto Guzzi engineers have also applied their expertise to the air intake and exhaust system, adding a high-performance filter for improved air flow and refining both intake and exhaust ducts for increased gas flow. The ECU mapping has been reprogrammed for sports use and offers a wider band of usable engine power than other models. For those wanting even more power, a factory race kit is available as an option, including hand-polished air ducts, velocity stacks, and a special racing exhaust and a remapped ECU. This kit improves overall performance. A stepper motor fitted to the electronic injection guarantees perfect idling and smooth starts regardless of weather conditions. Other technical additions include twin spark ignitions and positioning the injectors directly over the inlet manifolDual Sport near the valves. The alternator is between the cylinders. This makes the engine more compact and also offers significant advantages in terms of control and overall ride-ability. Lightened conroDual Sport, pistons and pistons rings help reduce weight and sintered valve guides improve smoothness and increased resistance to wear and tear. Other solutions have been put in place to improve lubrication: the oil pump has a higher flow rate and is more efficient; the cylinder head has a small hole that allows oil to be injected directly on to the exhaust valve; the crankcase and the sump and heaDual Sport have been modified to facilitate oil flow. Moto Guzzi’s patented "reactive" Compact Reactive Drive Shaft system delivers a smooth flow of power to the rear wheel and recalibrated six-speed gearbox now features new ratios that are ideal for even the twistiest of roaDual Sport. Gearing is tall to allow the sports-minded Guzzisti to savor every available horsepower.